In late 1939, just 2 years after Bulleid took up the C.M.E. post, the Southern Railway suddenly found itself on the British frontlines of the Second World War, and in need of some capable freight engines. Confined to the south of England, it was primarily a high-density commuter railway serving London and South-East England. Now it was a strategic war asset, and needed to move troops and freight in vast quantities to aid the defending forces. Bulleid concentrated on function and usability, and produced an 0-6-0 design to reduce problems of axle loadings. It contrasted strongly with the Maunsell designed 'Q' Class 0-6-0 of 1938, which had been built to Victorian era principles. 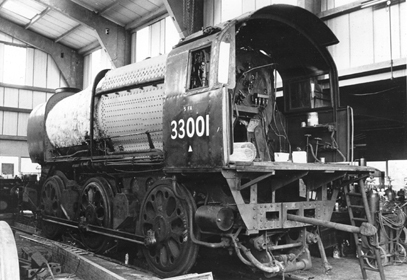 Despite their radical appearance, they were based on fairly conventional techniques, and shared many valve gear parts and the steam reverser with the 'Q' class. That said, it was suggested that if Bulleid had more time he may have encased all the valve gear in an oil bath like the Merchant Navy class. The Q1 was fitted with Bulleid Firth Brown driving wheels of 5' 1" diameter, a design type first seen on the Merchant Navy class. The boiler was the largest that would fit, using the boiler plates from a Lord Nelson class. The stepped light-weight external cladding was minimalist 'streamline' styling again, and not having running boards reduced the weight further. The 1942 design that emerged was the most powerful 0-6-0 steam locomotive that has ever run on Britain's railways. Powerful and light, the forty Q1s formed the backbone of the Southern's heavy freight capability. Although built under the wartime 'Austerity' regime, which stressed functionality first, the styling can also be attributed to Bulleid's modern streamlined boxy look. But this loco was also designed to be driver/fireman friendly, including an enclosed cab which both protected the crew and reduced the chances of being spotted by enemy aircraft. The tender's sliding shutters also revealed water fillers accessible to the footplate, saving the fireman from always having to go the top of the tender. They were nick-named Charlies, coffee-pots, and ocassionally dustbins. Perhaps most unusual was the distinctive tunnel-mouth shaped smokebox, with a short wide chimney topping a 5 nozzle blast pipe. The loco had Stephenson's link valve gear, and the large tapered boiler was fed by two injectors. An advantage of their shape was that they could be driven through a coach-washer for cleaning (in the same way as a 'Merchant Navy' class) at a time when manpower for this time-consuming chore could not be spared. Although primarily freight locomotives, they were frequently used on secondary passenger services. They not only thrived during the War, they were retained in service until the mid 1960s. Bulleid numbered the engines C1 to C40, but after nationalisation they were renumbered into British Railways' standard system, as 33001 to 33040, with the power classification of 5F, when no previously built 0-6-0 had exceeded 4F. Despite the Southern Railway having a distictive locomotive livery dominated by striking Malachite green colour with sunshine yellow lining, the Q1's being a war time solution, were sadly only ever painted black. Only the first locomotive built survived into preservation, and 'C1' is now part of Britain's national collection, currently at the National Railway Museum in York, (after spending 27 years on the Bluebell Railway in Sussex). All of the 40 Q1s were built during 1942; half were built at Brighton (C1 - C16), and half at Ashford (C17 - C36), there being distinct differences between the two builds. After the war the shed allocation varied in the main between Guildford, Feltham, Eastleigh and Tonbridge, and later Three Bridges; just a few being placed at Nine Elms and Hither Green sheds. Most worked for over 20 years, though their diligence to war-time weight-saving caused some problems in later life, when thin steel plates became rather porous. One retired Shed Master told me that in latter days some crews were instructed to shut the regulator of their Q1s when entering stations, so that they didn't blow ash through the sides of the smokebox on to passengers ! 0-6-0 main line steam locomotives built in Britain, and the ultimate development of this type.